All across the UK (and indeed the World) a whole new generation are getting back on the dance floor and swinging out to the sounds of a bygone era. Driven by a rejection of cynically manufactured pop music and an enthusiasm for all things “Vintage” people are grabbing a partner and discovering that Swing Dancing is not only fun, it’s addictive! SWING DANCE is an umbrella term for a series of dances that evolved in America during the Swing Era. These include the Lindy Hop, Charleston, Collegiate Shag and Balboa. Charleston is not, strictly speaking, a Swing Dance as it actually pre-dates the evolution of Swing Music. It was, however, a precurser of the most popular of all the Swing Dances – the Lindy Hop. Lindy Hop started life as a step variation in the Charleston (Shortie Snowden 1927) and rapidly found favour on the stages and dance floors of Harlem. 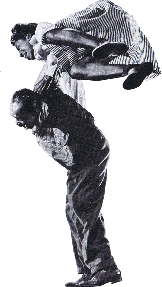 It was with the birth of Swing Music proper (1935) that Lindy Hop found a natural partnership. The propulsive rhythms inspired young black Americans in Harlem to create a spectacular dance full of high tempo movement and death defying aerials. The most notable venue in Harlem was the Savoy Ballroom and it was out of this cavernous dance hall that the most famous group of dancers emerged – Whitey’s Lindy Hoppers. WLH performed on stages across America and the World (Australia, Britain, Argentina etc) and also created some of the most dynamic Lindy Hop ever filmed -”A Day At The Races“ (1937) & “Hellzapoppin’” (1941). It is only in the last few years that Frankie Manning, the choreographer of WLH, passed away just shy of his 95th birthday. Frankie had a resurgent career from the mid-1980s onwards teaching Lindy Hop around the World. The popularity of Swing Dancing today is in no small part due to his enthusiasm and willingness to share his skills and experience. 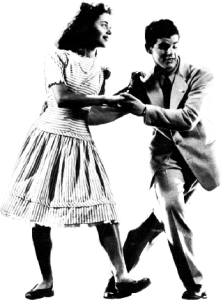 Throughout the late 1930’s the name Lindy Hop was replaced in the public consciousness with the term Jitterbug. The term is cited in Cab Calloway’s “Hepster Dictionary” as simply a “Swing Fan”. It is generally thought to refer to the fact that young swing enthusiasts could not sit still listening to the music. However, what it is clear is that very quickly the term became synonymous with the dance those Jitterbugs enjoyed, which was predominantly Lindy Hop. Swing Dancing was not confined to New York and Harlem but spread out across America. Hollywood embraced the new music & dance craze and very quickly incorporated it into the movies it produced. A young white dancer called Dean Collins had moved to Los Angeles from New York in the late 1930s and found Hollywood eager for his services. Dean worked as a dancer and choreograher and it was around him that a group of dancers coalesced developing a distinctive Los Angeles style of Lindy Hop – smoother, more linear and with clear roots on the social dance floor. Dean and his partner Jewel McGowan appeared in many movies and short films throughout the 1940s and have been called the “Fred & Ginger” of Lindy Hop. It is this style that particularly interests and influences the dancing and teaching of Robert Austin. By the late 1940’s Big Band Swing had lost it’s appeal and jazz music had changed to the more introspective “Be-Bop”. However, that did not mean that people ceased Swing Dancing. The Swing Rhythm has been defined as the accentuation of the even (or back) beats which gives a sense of horizontal drive. It is no surprise that this rhythmic device became a major feature of what came next. In the mid to late 1940s many of the former black big band musicians formed smaller, more economic units. Mixing Boogie Woogie with the Jumpin’ Jive of Cab Calloway and Louis Jordan these musicians created a new style of music which fused the rhythm of swing with the riffs and colloquial subject matter of the blues – it was called “Rhythm & Blues”. This style of music brought young people, both black and white, back onto the dance floor and in turn became the major component of the next big musical phenomena – “Rock‘n’Roll. In the mid-1950s when films like “Rock Around The Clock” and “Don’t Knock The Rock” were released in cinemas, the extras that were used to fill the dance scenes were local Lindy Hoppers from the Los Angeles clubs. We now associate Rock‘n’Roll with “Jive” but in those original movies it was strictly Lindy Hop. Lindy Hop had lasted as a popular dance for three decades. However, in the late 1950s new dances which emphasised solo performance and individual expression became the rage. Partner dancing was no longer fashionable and the Twist, Mashed Potato and Watusi ruled the dance floor.